Blog camp: The blog campers... get creative! 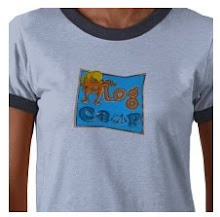 The blog campers... get creative! One of the many, many topics discussed at Blog Camp was the subject of creativity. If you feed the creative mind with the right sort of oxygen, can anyone light up? Having thought of myself as a deeply uncreative person for most of my life, the company of bloggers has challenged my pre-conceptions of myself. Are we all a little bit guilty of ring-fencing artistic expression and then filing it away into mental drawers that read CAN or CAN'T? Some of us cook, some of us knit, some of us can draw, or sew, or take beautiful photographs, but can we all do a little bit of whatever we put our minds to? When Julochka told the January Blog Campers to bring art journals, my mental "I can't do that" switch was immediately short-circuited. But when confronted with stacks and stacks of "pretty papers" and every imaginable sort of doo-dad, I was so impatient to begin that I started yelling (not altogether politely) for some glue and scissors. It was a wonderfully relaxing thing to do with our group, especially since it didn't inhibit me (in the slightest) from keeping up a steady stream of chat. Spud was talking about botox, boys and cars? B obsessed about yellow and her new favourite TV series: Glee. Bee is also pretty Glee-ful, but Spud was NOT impressed. As for my own Art Journal . . . well, did I create something equally stylish? Frankly, I didn't really have the knack for it that my creative and observant daughter displayed. Indeed, after completing five pages, my daughter noticed that I had put them in the journal both backwards and upside-down. Even when I photographed the spinning spider, Elizabeth's symbol for creativity, I realized that I had pictured it upside-down! thank you both for this lovely post!!! this is such a great collaborative post. and makes me feel SOOoooo much better after my terrible, horrible, no good, very bad day...thank you for giving me back a bit of the blog camp magic. This is really a true reflection of the weekend. My mind is screaming, I wanna go back, give me the blog camp bubble, so much more fun. Thank you B & Bee for making this beautiful collaboration. Every time I look at this again, it makes me miss BC even more... and the blue rooom! just a note about disagreeing with beth's parenting...sabin and camille were happily playing mariocart on the wii and, because it was past 11, beth tried to make camille come to bed. so i asked the perennial question--what are they gonna remember? and asked if they couldn't stay up a little longer since it was the weekend. :-) so no more drama than that. I have the WORST internet at the moment. I read this last night but didn't have the patience to post a comment..
this is perfect, I love it. I had the best best best weekend. Just can't blog about it yet, I can't find the words. You bloggy gals mean so much to me (blub blub). Awww, this is so fun!! I definitely want to come to the next one and meet all of you fabulous ladies!! yes, yes to this wonderful experience for all. this looks like so much fun! Thanks for giving us a sneak peek! I am pea green with envy. My Daring Daughter and I wish we were there. I would say that your innate creative talents got ahold of you and your camera and decided to picture the spider upside down (would be a great picture for a children's book "What's wrong with this image?). I came over from Bee's and enjoyed your camp experience! It looks like a petri dish of creativity!